We are looking forward to meeting you at the next SOFSEM. SOFSEM (SOFtware SEMinar) is the annual international winter conference devoted to the theory and practice of computer science. Its aim is to present the latest developments in research for professionals from academia and industry, working in leading areas of computer science. The very first SOFSEM was organized already in 1974. 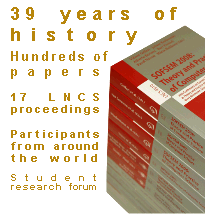 Since 1995 the proceedings containing the invited and contributed papers are regulary published in the series Lecture Notes in Computer Science by Springer Verlag. Software is the central theme of the SOFSEM conference. This means that next to the traditional strong and popular track on Foundations of Computer Science there are tracks focussed at the production process, the application areas and the social role of Software. These three tracks which represent the How, What and Why issues around software as an ingredient of human civilization whose role is becoming ever more important, are focussed on annually chosen themes. For the 2013 edition these themes are: Software & Web Engineering, Data, Information and Knowledge Engineering, and Social Computing and Human Factors. SOFSEM is the ideal conference for discussions, for establishing personal contacts with colleagues, and for exchanging ideas. At SOFSEM 2013 participants and lectures will be accommodated in the Hotel Bedřichov, Špindlerův Mlýn – an attractive winter resort town. SOFSEM is well-known for its familiar and inspiring atmosphere and is especially suited for young computer scientists. See you at SOFSEM 2013! See "howto" for IE, FF.